SQLScout 4.0.0 Released | IDEScout, Inc.
We are proud to announce SQLScout 4.0.0! 1. Support for database Views. SQLScout can display View objects in the “SQLite Explorer” view. Now you can visualize a View’s schema and its data, and execute SQL statements against any View. 2. Ability to save BLOBs as files. 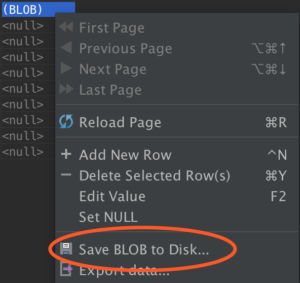 Just right-click on a BLOB value in the “SQLite Console” and select “Save BLOB to Disk…”. 3. Reveal saved files in the system’s file manager. “File saved” notifications (SQL files, diagrams and BLOBs) now include a link to reveal the saved file in the system’s file manager. 4. Support for SQLScout Server 4.0. We replaced XML with FlatBuffers for client/server communication in “Live Device” connections to Android devices. This change fixes several bugs related to String encodings, invalid XML characters present in database columns, and BLOB handling. 5. Automatically add or fix SQLScout Server version in build.gradle files. When creating a new “Live Device” connection, SQLScout will check that your project is using SQLScout Server version 4.0 or newer. If your project is using an older version of the server, SQLScout will offer to automatically add or update the correct version of the server in your project’s build.gradle files. SQLScout will also add IDEScout’s Maven repo to your project’s build.gradle files if necessary. Fixed deadlock in IDE when attempting to create a new “Live Device” connection. Fixed bug where “Room Migration” action was never enabled if the initial database sync failed to find ADB. Fixed bug in “Room Migration” where migration got interrupted when project contained Kotlin code.